The booming construction industry is heading towards a possible shortage of labour and traditional building materials. In addition to a critical shortage of skilled labour, the industry could also be facing a problem in the supply of building materials such as timber, bricks and steel. The current building boom is triggered by an expanding population; however, the educational shift at the high school level combined with prioritising tertiary and university education over vocational and technical training/ apprenticeships, has left the building industry with an ageing workforce and a severe shortage of labour to complete the work. The problem hasn’t cropped up overnight; manufacturing industries have been raising the alarm bells for years. With the ageing workforce consisting of masters of trade heading to retirement and not enough new and younger workers entering the industry, the transfer of knowledge is not taking place and is at risk of being lost forever. What does this mean for the building industry? The serious shortage of working apprentices on the job to learn the trades will lead to higher costs and serious delays, especially when it comes to the specialised skills of carpenters, bricklayers, plumbers and electricians. However, the shortage of skilled labour and traditional building materials is likely to increase the use of alternative solutions such as Insulated Concrete Forms (ICF). 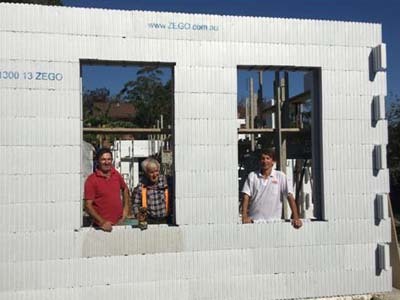 Building technologies such as ICF have a strong DIY foundation, assisting with quicker adoption of these solutions. Though these technologies may not fully replace the need for skilled tradesmen, they will certainly assist in a better use of transferred skills and will alleviate some inevitable pain for residential and commercial builders who may soon find themselves in a position where they simply cannot complete their builds. Skilled tradespeople will continue to be in demand in the building industry, regardless of the advent of user-friendly building technologies. However, the day is not far off when a crew of ICF installers cross-trained in the required DIY trades will be able to complete 95 per cent of the work required on any residential or small commercial project independently.